Skype for Windows 7 - one of the most popular social applications designed to provide communication between users via the Internet. The application allows you to create a full-fledged conference, consisting of several participants. For quick communication, you can use the chat, equipped with emotional icons. Through the use of chat, users can share whole files and archives. The program has an advanced configuration menu in which you can customize the microphone, speakers and personal information. 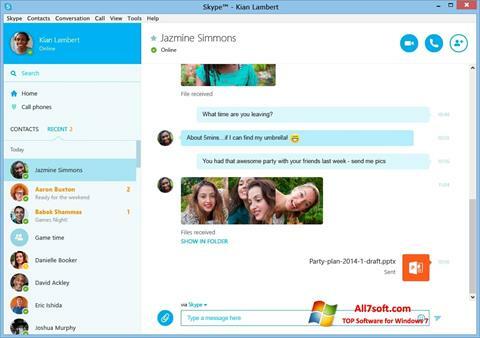 You can free download Skype official latest version for Windows 7 in English.